When I checked the weather forecast for the week, I noticed that it was going to rain almost everyday. I love when it rains but after a storm, the water turns into dirty brown puddles which people dread having to jump over. into cute little duck ponds! Who knew dirty puddles could be so fun? this is the most adorable thing. Great idea! I'll have to do this when I move back to Washington state- plenty of opportunity. oh katie! i just love you to pieces. I want to visit these duck ponds! I love the way your mind works and I love your incredible sense of color. You are SO AWESOME! love you katie! So cute! I love your creativity...wish I could think the way you do!!! Great idea! I might uh..."borrow" it. It always rains here. I love your blog, it always give me a little bright spot in my day. Thanks you for being so colorful and positive!! 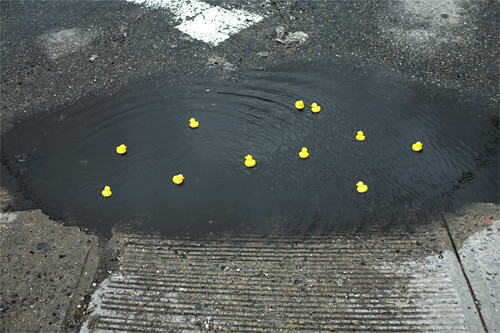 Aw look how happy those puddles are! You'd be surprised how many people will let you arrange rubber ducks in their place of business and take photos if you ask nicely. That makes me laugh - I wish I had your creativity! 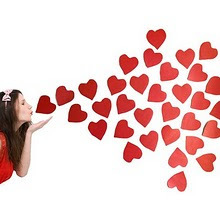 I really admire your positive mind and good ideas to make other people laugh a bit, in their busy lives. Love it. That would totally make my day if I happened upon it. I want to try this idea here in Omaha. Adorable!! As per usual! Its raining here today so maybe I'll try this tomorrow! This is perfect smile to those rainy days!!! Duckies love water (even the rubber duckies!)!!! I love how you are always trying to find little ways to brighten the world! I love your creativity!!! You are so fun! I secretly think you're a magical being. Like a fairy or Mary Poppins. 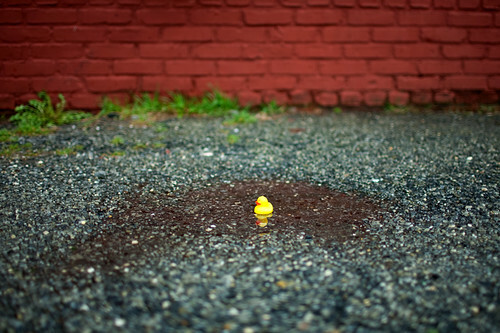 I love your playful personality and your creative outlook... seeing fun for duckies where others see only mud! what a wonderful way to bring colour into a dull day. :D thank you for brighting mine. amaaazing idea! it's gonna rain all week here in new zealand too! LOL so cute Duck!!! i like the pictures!! So cute!! I love this idea! You are so creative! That is the cutest thing I have seen in a long time! Thanks for making day-to-day things so much fun, Katie. I don't know how you come up with all these brilliant ideas, but you make the world such a brighter place. I'd love to try this here in San Diego, but they really don't know how to handle rain -- I'd be afraid they'd hurt themselves. Where oh where did you buy those ducks? i love everything you do, but this is just the best. Great way to brighten up a rainy week! Fabulous idea! thank you for all the colorful and creative inspiration! You know what? I bet that you've saved people's lives today. Somebody was probably so depressed that they just didn't want to live a moment longer, and they might have stepped out in the road and seen a duck - just smiling innocently at them and so full of delight and hope, and they kept on living. It was beautiful of you to do that. Big smile on my face :D! Greetings from a very rainy country. it's soo nice and adorable idea! Absolutely adorable. Proof positive that even a rainy day can have an upside! Hi Katie! We're on the same wavelength! I bet you made lots of people smile! Ducks rock. I loved your idea so much! You make NYC a prettier place. Thanks for inspiring me to actively work on being happy:) sometimes I can get down on things but you remind me to see the best in every situation! You are adorable and so creative! A woman I once knew told me a story about her house flooding in the middle of winter. It was during the Great Depression and they couldn't afford heat... so their kitchen floor ended up freezing over! Her mother, instead of being (understandably) stressed, angry or upset, told her family that that night, they were going to go ice skating in the kitchen! I have to say that your blog makes my day every time I look at it. Today is no different. 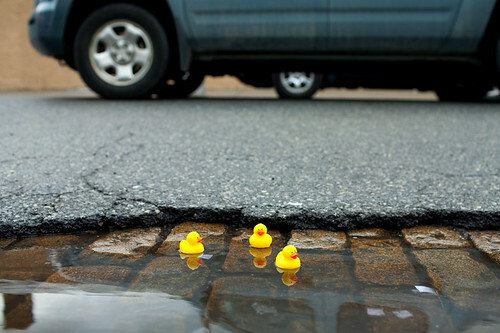 I love the little duck ponds out of puddles. Such an adorable concept. This would definitely make me smile if I saw it on the streets. Please PLEASE keep it up! this is the cutest thing ever. I also wrote about rain recently! I saw someone do this a couple of months ago...very cute and it does make you smile! It's very cute and poetic ! Be nice, feed the ducks!!! With plastic worms and plastic bread?! I love how you can make fun out of anything! I always dread the rain cause I can't get out and shoot! Thanks for the inspiration!! cute cute cute :) I may have to do that with my toddler one day --if it ever rains in Texas again that is. Oh what a cute idea. Original & creative as always ! Those little ducks are so cute ! I'd loved to see the faces of people walking by!!! I love it! 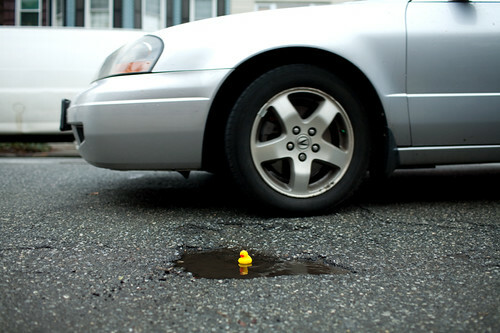 but all I can think of is some little child running on to the road to pick up the cute duckies. Even my 4yr old would be so taken by these floating around on the road she would be out there in a flash. Maybe on puddles that are not on the road.. please from all the mothers out there. Omg, this is the sweetest thing I ever seen someone do! It's just so cute. I really wish someone would do my day in that way! You're so full of so cute suprices and I so love your blog for that! Keep strong and go on! I have been a fan of yours for a few years now. I am a high school art teacher and have taught pre-K - 12 for 18 years. Unfortunately I have been seeing a decline in students' ability to think creatively and originally. (you would not believe how many hearts, butterflies, peace signs, suns & sunsets I see done the same way). It is refreshing to visit your site & see such creative inspiration! I think even hs students need to act like kids when creating art-no fear of failure, just have FUN! THANKS for reminding all your readers what art is all about! Excellent and beautiful ideas!! I follow the blog everyday. You have inspired me so much with your photos and photography! I love it! I literally sat all day today and went through your WHOLE blog and read what you said about depression running in your family and how you like to surround yourself with fun things and happy things. And i agree. One hundred percent. You seriously made me re-excited to do photography. I had grown into this bored little lull and I'm so excited to go out there and have FUN again! Thank you so much for being a beautiful and bright spot of sunshine in this troubled world! P.S. 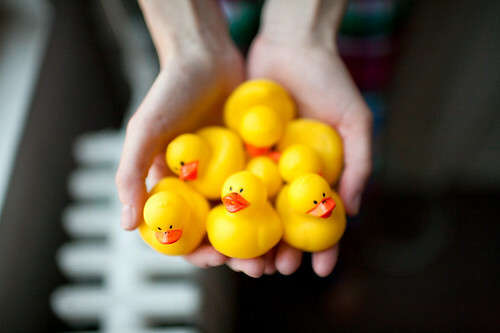 I'm going to go buy tons and tons and tons of these ducks and release them into our duck pond at my university! They're so happy! these little guys are adorable! the striking contrast between the bright yellow and murky water is spectacular! Unlike the anonymous mother here, I appreciate your bright optimism and I love this idea. 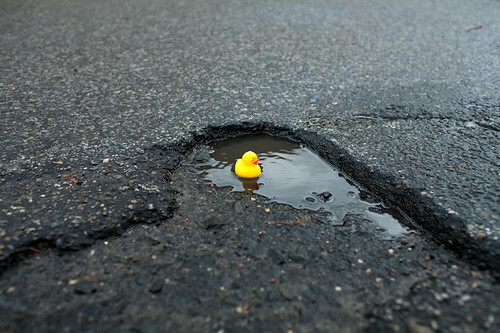 But like that anonymous mother, this made me just a tiny, teeny bit concerned--you picked the ducks up when the rain puddles dried up, right? 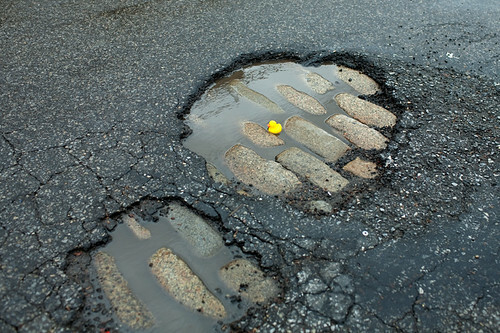 I'd hate to see a shriveled, melted little mound of yellow plastic/rubber molded to the crack in which it once floated. Your blog inspires us to do amazing things. I can't wait to tell everyone about your blog! I'm new commenter! What a great idea, i love yellow rubber ducks! I had mechanic toy lttle chicken too that i left in Indo:(. I have to collect them again. So cute! That is one of the cutest ideas I've ever seen!! I love it!! That would totally make me smile if I saw that! As someone who leaves artwork on the sidewalks in the city, I ABSOLUTELY LOVE THIS. I'm geeeing in excitement. aww the ducks are so cute! this is a really good idea. such a simple concept, such a grand idea! ducks rule! I love all of your work Katie! You are very creative! I have probably gone through all of your posts looking at your beautiful and fun art! I love that your not afraid to use color and therefore use it everywhere! Your creativity is awesome and inspiring!!!! Keep making people smile through the little things in life! Your great! Your ideas are always so good and sweet. I love it how you make other people smile and how you make everything nice en happy. This is so great, going to have to try it in my rainy maritime province! This idea was too good not to borrow - especially when you work in a pediatric hospital! Fantastic shots, tehy made my day! OH MY WORD! Love it! Mind if I steal the idea sometime? Nashville's been getting a lot of rain lately, too. I love this photoshoot! it is the sweetest thing i have ever seen. ever! ahaha this is excellent! Our local little 'fruit barn' (yeah, coastal NSW Australia- so not NY!) has a wacky owner who floats ducks in the puddles. I'll have to snap some pics and post them. I'll add myself to your mass of followers! Aside from unabashedly jumping in them, barefoot, this is probably the most awesome thing you can do with a puddle! You've got a great imagination you're putting to good use! I LOVE this! Great idea! 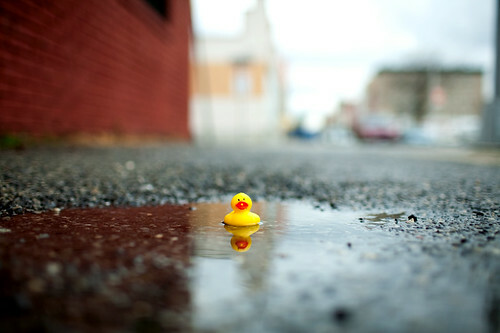 Rainy days can be so gloomy but definitely not when there are duckies involved!